Combination Lock, 4 Digit Combination Padlock, School Lock, Gym Lock and Outdoor Padlock by ZHENGE at SMIFCU. Hurry! Limited time offer. Offer valid only while supplies last. Specification: 1. Dimensions: 4.5in*0.8in*1.7inch(L*W*H) 2. Shackle diameter: 0.23 inch 3. Material: Hardened Steel and high strength zinc alloy 4.
for the buyer's information, this hasp combination lock is larger than other padlocks with combination in the market, so please check the size information in the images above before buying. If you are not 100% satisfied with the quality of our settable combination locks within 60 days, simply reply about the issue to the shipping email that you will have received from us. We will come back to your ASAP within 24 hours. 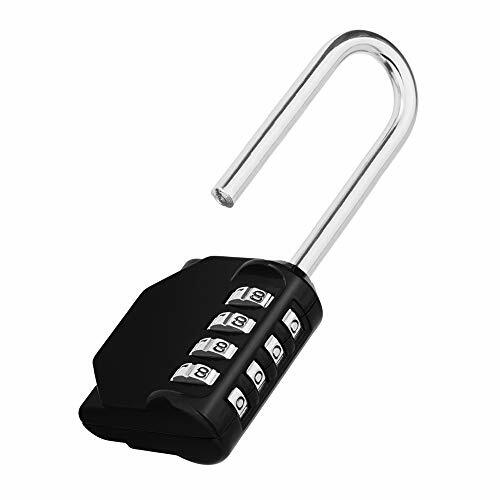 Set Your Own Lock Combination: The 4 number combination lock takes 10 times longer to crack than a 3 digit lock. You can set any combination with 10000 unique choices that you know they are more reliable and safer. Easy to Use: Setting or Resetting is easy following the instructions which are always included. Large numbers and the side window design make it clear and effortless to lock and unlock in daily use. Sturdy Construction: The heavy duty combianation locks come with high strength zinc alloy bodies, hardened steel shackles and excellent caft manship. They are weatherproof, anti-rust and resistant to cutting and sawing. They are designed to be the most durable dial combination locks for you. Wide Application: The combination padlocks are perfect for both indoor and outdoor tasks such as gym lockers, school & employee lockers, canbinets, pantries, toolboxes, gate & door hasps, garages, sheds, fences and general storage. 1 Black Resettable Combination Lock: You will be receiving 1 pack of keyless black 4 dial combination lock. If you have any questions about this product by ZHENGE, contact us by completing and submitting the form below. If you are looking for a specif part number, please include it with your message.